"for studies of the structure and function of the ribosome"
The Nobel Prize in Chemistry for 2009 awards studies of one of life's core processes: the ribosome's translation of DNA information into life. Ribosomes produce proteins, which in turn control the chemistry in all living organisms. As ribosomes are crucial to life, they are also a major target for new antibiotics. This year's Nobel Prize in Chemistry awards Venkatraman Ramakrishnan, Thomas A. Steitz and Ada E. Yonath for having showed what the ribosome looks like and how it functions at the atomic level. All three have used a method called X-ray crystallography to map the position for each and every one of the hundreds of thousands of atoms that make up the ribosome. Inside every cell in all organisms, there are DNA molecules. They contain the blueprints for how a human being, a plant or a bacterium, looks and functions. But the DNA molecule is passive. If there was nothing else, there would be no life. The blueprints become transformed into living matter through the work of ribosomes. Based upon the information in DNA, ribosomes make proteins: oxygen-transporting haemoglobin, antibodies of the immune system, hormones such as insulin, the collagen of the skin, or enzymes that break down sugar. There are tens of thousands of proteins in the body and they all have different forms and functions. They build and control life at the chemical level. An understanding of the ribosome's innermost workings is important for a scientific understanding of life. This knowledge can be put to a practical and immediate use; many of today's antibiotics cure various diseases by blocking the function of bacterial ribosomes. Without functional ribosomes, bacteria cannot survive. This is why ribosomes are such an important target for new antibiotics. This year's three Laureates have all generated 3D models that show how different antibiotics bind to the ribosome. These models are now used by scientists in order to develop new antibiotics, directly assisting the saving of lives and decreasing humanity's suffering. Gitanjali, a collection of poems, described as "profoundly sensitive, fresh and beautiful verse"
The Albanian-born nun, who made India her home, won the prize for "work undertaken in the struggle to overcome poverty and distress, which also constitutes a threat to peace". Mapping ribosomes, the protein-producing factories within cells, at the atomic level. He shares the prize with Thomas Steitz and Ada Yonath. 1. In 2007, the UN's Intergovernmental Panel on Climate Change headed by India's R K Pachauri shared the Nobel prize in peace with Al Gore. 2. V S Naipaul, Trinidad-born British writer of Indian origin, won the Nobel prize in literature in 2001. 3. Abdus Salam, born in undivided Punjab and a citizen of Pakistan, shared the Nobel prize in physics in 1979 with Steven Weinberg for his work on electroweak unification, one of the important puzzles of modern theoretical physics. 4. British author Rudyard Kipling, born in Bombay (now Mumbai) in 1865, won the Nobel prize in literature in 1907. 5. Ronald Ross, born in Almora, Uttarakhand, in 1857 was awarded the Nobel prize in medicine in 1902 for his work on malaria. He was a British citizen. Venkatraman "Venki" Ramakrishnan (Tamil: வெங்கட்ராமன் ராமகிருஷ்ணன்; born 1952) is a structural biologist at the Laboratory of Molecular Biology of the Medical Research Council located in Cambridge, England. He is a Fellow of Trinity College, Cambridge. He was awarded the 2009 Nobel Prize in Chemistry, along with Thomas A. Steitz and Ada Yonath. Venkatraman Ramakrishnan was born in 1952 in Chidambaram in Tamil Nadu, India, where he completed his pre-university studies at Annamalai University. Later, he obtained his B.Sc. in Physics from Maharaja Sayajirao University of Baroda, India, in 1971 and then his Ph.D. in Physics from Ohio University in 1976. He then spent a year taking classes in biology at the University of California, San Diego while transitioning from theoretical physics to biology. Venkatraman Ramakrishnan has published more than 95 research papers, the earliest being in 1977. In 2000, Venkatraman Ramakrishnan's laboratory determined the structure of the 30S subunit of the ribosome and its complexes with several antibiotics. He also published three papers about his ribosome research in the August 26, 1999, and September 21, 2000, issues of the journal Nature. This was followed by studies that provided structural insights into the mechanism that ensures the fidelity of protein biosynthesis. More recently, his laboratory has determined the atomic structure of the whole ribosome in complex with its tRNA and mRNA ligands. Ramakrishnan is also known for his past work on histone and chromatin structure. Ramakrishnan is known for his work on the determination of the three-dimensional structure of the small ribosomal subunit and its complexes with substrates and antibiotics, which has shed light on the mechanism that ensures the fidelity of protein synthesis, and for his work on the structures of chromatin-related proteins. Ramakrishnan was awarded the 2009 Nobel Prize in Chemistry along with Thomas A. Steitz and Ada Yonath. Ramakrishnan will be awarded the Nobel Prize along with one-third of the total prize money of 10 million Swedish kronor ($1.4 million), in a ceremony in Stockholm on December 10. Thus, he became the seventh Indian or person of Indian origin to win the Nobel Prize. Official Nobel Foundation website telephone interview audio with him is available here. He is a Fellow of the Royal Society, and a member of EMBO and the U.S. National Academy of Sciences. ^ "Venki Ramakrishnan". Laboratory of Molecular Biology. 2004. http://www.mrc-lmb.cam.ac.uk/ramak/. Retrieved 2009-10-07. ^ "New Trinity Fellows". The Fountain, Trinity College Newsletter. https://alumni.trin.cam.ac.uk/design/pdfs/Fountainspring09.pdf. Retrieved 2009-10-07. ^ "Dr. Venki Ramakrishnan". Trinity College, Cambridge. 2008. http://www.trin.cam.ac.uk/index.php?pageid=176&conid=350. Retrieved 2009-10-07. ^ Abadjiev, Stanislav P. (7 October 2009). "The Nobel Prize in chemistry is going to Ramakrishnan, Steitz, Yonath". Science Centric. http://www.sciencecentric.com/news/article.php?q=09100741-the-nobel-prize-chemistry-is-going-ramakrishnan-steitz-yonath. Retrieved 2009-10-07. ^ 2009 Nobel Prize in Chemistry, Nobel Foundation. ^ Press Trust of India (PTI) (7 October 2009). "Venkatraman's teacher happy over ward's Nobel". Times of India. http://timesofindia.indiatimes.com/city/chennai/Venkatramans-teacher-happy-over-wards-Nobel/articleshow/5098759.cms. Retrieved 2009-10-07. ^ a b c Press Trust of India (PTI) (7 October 2009). 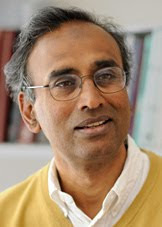 "Venkatraman Ramakrishnan: A profile". Times of India. http://timesofindia.indiatimes.com/india/Venkatraman-Ramakrishnan-A-profile/articleshow/5098151.cms. Retrieved 2009-10-07. ^ "FACTBOX: Nobel chemistry prize - Who are the winners?". http://www.reuters.com/article/topNews/idUSTRE5962EE20091007. Retrieved 2009-10-07. ^ Sonwalkar, Prasun (October 8, 2009). "Venkatraman Ramakrishnan wins Nobel for Chemistry". Press Trust of India (PTI). http://www.ptinews.com/news/318589_Venkatraman-Ramakrishnan-wins-Nobel-for-Chemistry. Retrieved 2009-10-07. ^ Associated Press (7 October 2009). "Profile: Dr Venkatraman Ramakrishnan". Indian Express. http://www.indianexpress.com/news/profile-dr-venkatraman-ramakrishnan/526251/. Retrieved 2009-10-07. ^ "Publications (Venki Ramakrishnan)". Laboratory of Molecular Biology. http://www.mrc-lmb.cam.ac.uk/ribo/homepage/ramak/ramak_publications.html. Retrieved 2009-10-07. ^ "Welcome to the Ramakrishnan Lab web page". Laboratory of Molecular Biology. 2004. http://www.mrc-lmb.cam.ac.uk/ribo/. Retrieved 2009-10-07. ^ "About the PNAS Member Editor". PNAS. http://nrc88.nas.edu/pnas_search/memberDetails.aspx?ctID=20004810. Retrieved 2009-10-07. ^ "All Nobel Laureates in Chemistry". Nobel Foundation. http://nobelprize.org/nobel_prizes/chemistry/laureates/index.html. Retrieved 2009-10-07. ^ Overbye, Dennis (October 7, 2009). "Three Win Nobel for Ribosome Research". The New York Times. http://www.nytimes.com/2009/10/08/science/08nobel.html?em. Retrieved 2009-10-07. ^ "Venkatraman Ramakrishnan Audio Interview". Nobel Website. http://nobelprize.org/nobel_prizes/chemistry/laureates/2009/ramakrishnan-interview.html. Retrieved 2009-10-07. Venkatraman Ramakrishnan, homepage at MRC Laboratory of Molecular Biology.